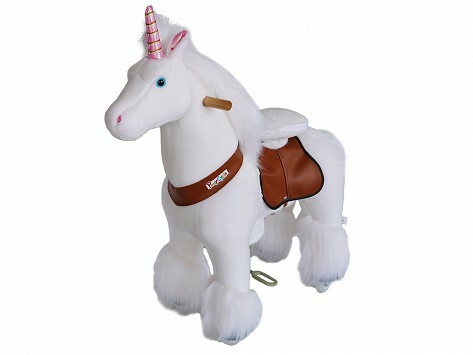 Kid-power provides the magic to propel this plush riding unicorn toy. It’s easy to move and steer and will provide endless fun while little riders burn off energy, indoors or outside. Care: Only for home & private use, not suitable for commercial use. Do not ride if over 55 lbs. Maximum load capacity: 55 lbs. 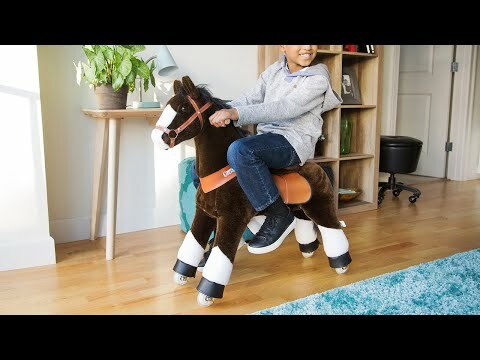 Dimensions: 18.1" x 11.4" x 20.1"
We’re committed to trying out all of our products at The Grommet—and if that means hopping on a riding horse toy, then we’re happy to oblige. In truth, we couldn’t resist taking the plush animals from PonyCycle for several spins around the office. Even though we did, we have to ask you other grown-ups not to. They’re only made to handle up to 88 pounds. So we had children test them out to confirm our findings—that these plush ride-ons are easy to operate and endlessly fun.